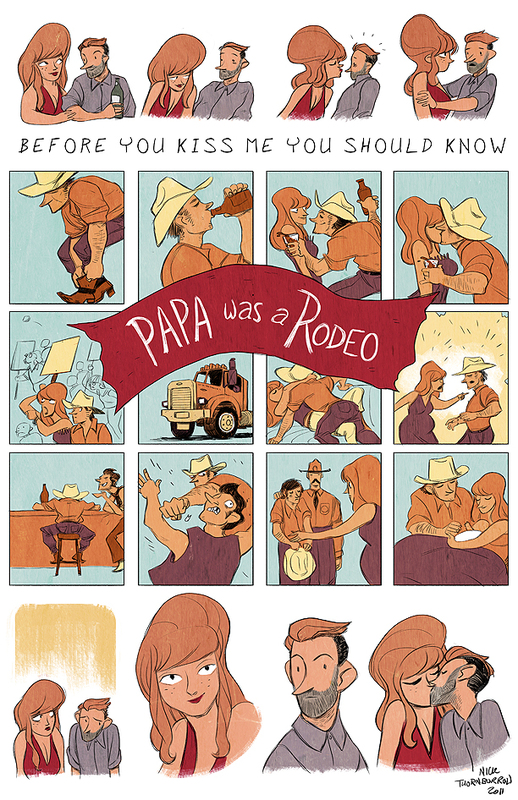 Papa Was A Rodeo | 69 Love Songs, Illustrated. This is beautifully drawn, but it bothers me that it portrays a man and a woman. The song lyrics are “I like your twisted point of view, Mike”, which would suggest that either the character singing is female (despite Stephen Merritt being male) or that the two characters in the song are both men. 1. Mike could be a female nickname. 2. The song turns into a duet at the end between a man and a woman. Of course only just saw the above two comments now…blatant or not, Stephen Merritt is gay and male…and the reference to the “trucker’s hand” is pretty pointed. I remember reading that Stephin meant for the song is meant to be sort of a Lee Hazelwood/ Nancy Sinatra tribute. Nancy played a girl named Mike in the movie The Wild Angels. But then again, gender usually pretty ambiguous in his songs..
9 Illustrations For The Magnetic Fields’ “69 Love Songs" | シ最愛遲到. !